Enjoy a self-guided tour around beautiful Seneca Lake, sampling delicious pasta themed dishes paired with wine at 30 participating wineries. Pick up your gift item at your chosen starting winery then start sampling pasta dishes paired with delicious award-winning wines. A snowy start to our event but no delays. 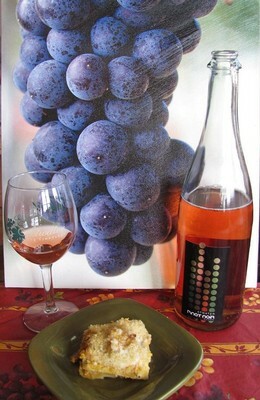 Our recipe is savory and delicious and we are pairing it with our Pinot Bubble a dry, carbonated Pinot Noir. A perfect match for our Butternut Squash Lasagna with Goat Cheese, Sweet Sausage, Sage, and Breadcrumbs. Of course we always serve a vegetarian option at all of our events. Simply omit the sweet sausage and use more fennel and onion if you wish better complexity. Enjoy! flavor to this lasagna, while the tender pasta keeps things light. Serves 6-8. Delightful paired with our Pinot Bubble wine. Roast the squash and garlic. Position a rack in the center of the oven and heat the oven to 425°F. Put the squash cut side up on a large, heavy-duty rimmed baking sheet. Put half of the garlic cloves and 1 sprig of thyme in each cavity. Drizzle each with olive oil and then season each with salt and a few grinds of pepper, lay onion on roaster pan, cover loosely with foil. 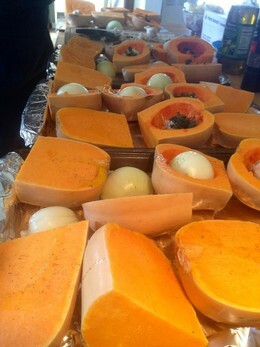 Roast until the squash is browned in spots and very tender, when pierced with a skewer, 45 to 50 minutes. Turn over if necessary. Remove from the oven and let cool completely. Discard the thyme sprigs. Peel the garlic and put in a large bowl with the roasted onion. Scoop the squash flesh from the skins and add it to the bowl. At this point, you can mash it all together or use a food processor gently pulsing till lumps are gone. Season to taste with salt and pepper. Reduce the oven temperature to 350°F. Brown the sausage in a skillet with the fennel and onion until no longer pink. Drain in a colander and when cool enough to handle, use your food processor again pulsing to break the large clumps of sausage into smaller bits. Melt 4 Tbs. of the butter in a 3-quart saucepan over medium heat. Add the sage sprigs and cook until the butter is fragrant, 3-4 minutes. Remove the sage and save for the breadcrumb topping. Add the flour and whisk until smooth and golden, about 2 minutes. Gradually whisk in the milk and cook, whisking occasionally, until thickened enough to coat the back of a spoon, about 15 minutes. Stir in the goat cheese, 1/2 cup of the pecorino, the nutmeg, salt to taste, and a few grinds of pepper. Set aside 1-1/2 cups of the sauce and mix the rest with the mashed squash. Melt the remaining 1 Tbs. butter in a small skillet over medium heat. In a small bowl, mix the breadcrumbs, reserved sage crumbled, chopped thyme, butternut squash seed oil if using. Add the melted butter and mix well. Assemble and bake the lasagna. Spread 1/2 cup of the reserved cheese sauce over the bottom of a 8 x10 x3-inch baking dish. Cover the sauce with a slightly overlapping layer of cooked noodles, cutting them as needed to fill any gaps. Spread 1 cup of the squash mixture evenly over the noodles then a bit of sausage. Add another layer of noodles and repeat the layers as instructed above. Spread the remaining 1 cup cheese sauce evenly over the top. Sprinkle with the breadcrumb mixture and the remaining 1/2 cup pecorino. Cover the baking dish with foil and bake for 45 minutes. Remove the foil and bake until the top is browned and bubbly, 15 to 20 minutes. Cool for at least 10 minutes before cutting and serving. Mountain Home magazine article featuring our Tasting Room. The Finger Lakes region of New York has become a major bon vivant’s travel destination. There are plenty of spots for excellent boating, fine fishing, invigorating hiking, long-distance biking, sensational skydiving, great golfing, and even championship car-racing. The area is loaded with world-class wineries, tasty microbreweries, mind-blowing distilleries, artisanal cheese dairies, homemade chocolate shops, aromatic coffee roasters, gourmet seed oil producers, bee-loving honey farms, heirloom vegetable markets, and some of the best eateries around. All of this amongst the breathtaking views that can be experienced throughout four spectacular seasons that make cool climate vacations one of the “hottest things going right now. And the village of Watkins Glen, at the southern tip of Seneca Lake, is sitting smack dab in the middle of it all. For tourists, it is a great location for base camp lodging. For residents, it is the perfectly centered meeting place for activities of all kinds. You might say that it is poised to take over as the central hub of a party that is already well under way. One local business has brainstormed a much-needed addition to that party. 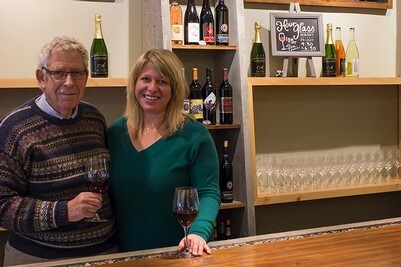 Atwater Vineyards, a winery that lies on the eastern shores of Seneca Lake a few miles north of Watkins Glen, recently opened the ultimate storefront in the midst of this blossoming Finger Lakes capital: The Tasting Room. Located at 204 North Franklin Street, the project focuses on bringing together a constantly rotating selection of the region’s best products, all under one roof. The result is a convenient and friendly one-stop taste-and-shop that relays the strong spirit of commonality and excitement that is rippling through the lakes. Atwater Vineyards is an award-winning winery that opened its doors in 2000. Their specialties include exquisite sparklers, crisp Rieslings, fragrant Gewürztraminers, surprisingly rich cool-climate reds, and luscious late harvest dessert wines. But perhaps the most special attribute of Atwater is their sense of community and the pride they have for the entire Finger Lakes region. They have a wonderful rapport with local businesses, and strive to make a Finger Lakes visit the best that it can be. Their Web site (www.atwatervineyards.com) lists information and background on the local grape varietals; a bit of regional history; a link to the wineries of all of the “other lakes;” a list of top local places to stay, eat, and play; and even a live forecast and weather station. Most wineries open a second tasting room (sometimes called a satellite location) in order to offer another venue in which to serve their own wines. But when Atwater owner Ted Marks came up with the original idea for The Tasting Room he envisioned a place where the visitor could savor a taste of many local wines. In other words, instead of just pouring his own wines, he was inspired to promote the wines that he loved drinking from all five wine regions of New York State: his own Finger Lakes region, as well as Niagara, Lake Erie, Hudson River, and Long Island. He serves local artisanal cheeses and hard ciders as well. Now, that’s a good neighbor. Her first move was to hire a skillful and creative designer. Gideon Stone, from HOLT Architects in Ithaca, “did a fantastic job of putting our ideas into concrete, no pun intended.” Contemporary, clean, and inviting, you can’t help but be drawn to the artistic concrete bar edged with a trough of polished lake stones: terroir built right in. Next, Katie secured the ideal person to manage. A familiar and favorite face for many who enter the store, Jessica Giles comes with extensive experience in both the local wine and food industries, not to mention a passion for people and the Finger Lakes life in general. A well-educated staff soon followed, and the doors to the new venture opened in August to the delight of everyone who was waiting in anticipation. Big thumbs-up was the immediate reaction. And it was two-fold, with glowing reports from outsiders to the region, as well as overwhelming praise from the local merchants. The Tasting Room has been an integral part of every Watkins Glen activity since, from the September Car Classic to Village Christmas to weekly Taco Tuesdays. It’s hard to remember the town without it, and equally obvious that a void was filled when the Atwater mission materialized. Ted and Katie have, um, definitely hit the mark. When traveling to any great wine region of the world, an astute visitor will carefully plan their stops, keeping distance, consumption, and timing well organized. The general rule is to visit from three to five wineries maximum, and to make sure to have a designated driver. Also, remember that the winery tasting rooms close by 6 p.m. Just like the Napa Valley of California, the Willamette Valley of Oregon, and the Columbia Valley of Washington State, the Finger Lakes of New York excursions should be scheduled as a daytime activity. Which brings us to another lovely perk of having a well-connected tasting facility in the downtown area of its heartland city. The Tasting Room is open until 8 p.m. on weekdays, and 9 p.m. on weekends, which offers both visitors and residents a locale in which they can celebrate—and be a part of—the provincial wine scene after official winery hours. You may find winemakers stopping in to deliver some wine, or interested sommeliers traveling through, or restaurateurs checking in on the latest vintage releases, or just animated wine lovers discussing their Finger Lakes visits of the day—the type of public communion that is the essence of great societies. The easy access to hotels within walking distance only sweetens the pot, and opens up a whole new category of nightlife for a small town that is an intriguing work in progress. The selections change frequently, with new wines being added to the list every week. A simple tasting fee of $5 includes your choice of six tastes from an extensive list. The $8 wine flights are educational and enlightening, and can be enjoyed by anyone from beginner to seasoned pro. A typical flight might include a comparison tasting of four different Rieslings, or maybe a lineup of versatile cool-climate reds like pinot noir, cabernet franc, and lemberger (aka Bläufrankisch). The flights change as often as the wines, and you are always welcome to design your own. Or just order your favorite wine by the glass or share a bottle with friends. Comfortable stools allow you to settle right in. Also on the menu is The Tasting Room Cheese Plate of the Day. I’ve been thrilled to find raw cow’s milk Camembert, aged goat’s blue, and the most creatively flavored cheddars, all made just a short distance away. Alongside, you’ll try some of the regions yummiest fruit preserves and honey. Everything is available for purchase as well, so you can replicate your gastronomical experience at home. For more information about Watkins Glen’s newest attraction, give them a call at 607-210-4324. I’ll be seeing you there!